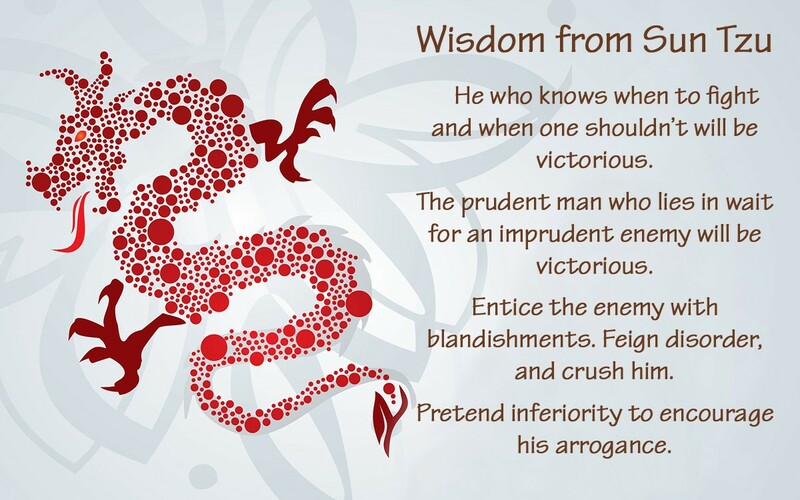 Special Frontier Force-The Problem of Espionage: The Chinese military philosopher in a military treatise known as PING-FA(The Art of War) written c. 400 BC mentions the use of secret agents and the importance of good intelligence. Special Frontier Force-The Problem of Espionage: Establishment No. 22 or Special Frontier Force represents a military alliance/pact between the United States, India, and Tibet to confront the military threat posed by the Communist Red Dragon’s occupation of Tibet since 1950. It is no surprise that at Special Frontier Force we have constantly experienced the problem of espionage orchestrated by the People’s Republic of China. To obtain knowledge of enemy’s intentions intelligence systems have been in use from ancient times. The concept of intelligence is not new. 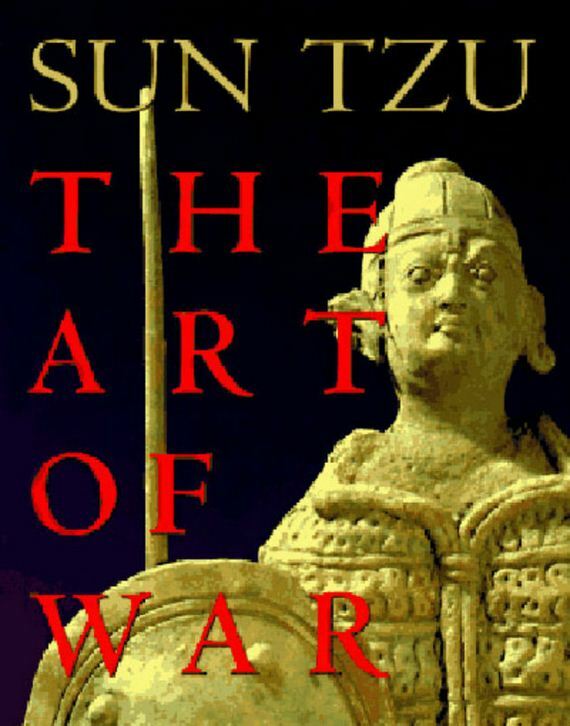 The military treatise “PING-FA”(The Art of War) written c. 400 BC by the Chinese philosopher Sun-tzu mentions the use of secret agents and the importance of good intelligence. The intelligence service of People’s Republic of China is known as Social Affairs Department.The term espionage describes the process of obtaining information using spies, secret agents, and involves the use of illegal monitoring devices. At Establishment No. 22 or Special Frontier Force the evidence for espionage conducted by the People’s Republic of China is revealed by the photo images obtained by China’s spies and secret agents. 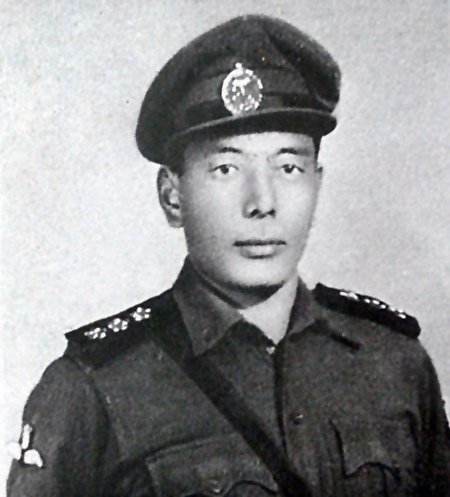 After investigation, the Department of Security of Central Tibetan Administration had dismissed from Service its top military leader/Political Leader/Dapon Radug( or Ratuk) Ngawang during 1976. Another Senior Political Leader Jamba Kalden had voluntarily retired from Service during 1977 after admitting that he had failed to stop or prevent the acts of espionage. It is very interesting to mention that Dapon Ratuk Ngawang had actually escorted His Holiness the 14th Dalai Lama on his way to India after the failed National Uprising Day( March 10, 1959 ) in Lhasa, Tibet. 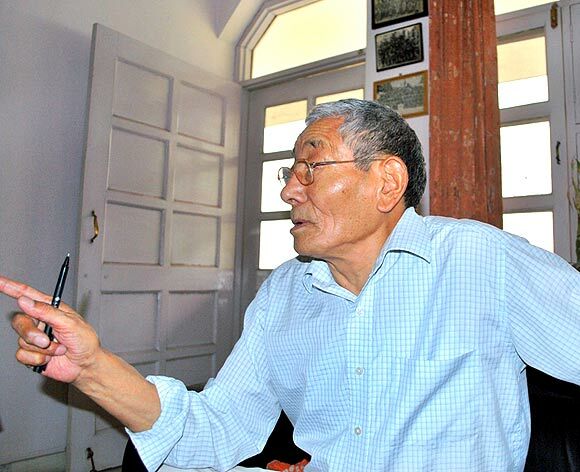 Ratuk Ngawang, is currently 85-years old, is not formally charged for any crime or illegal activity by the Government of India or Tibetan Government-in-Exile. After his retirement, he was permitted to live in India in the Capital City of New Delhi and he draws a modest amount of pension for the years he spent in Service. I had worked with him at Establishment No. 22/Special Frontier Force from September 1971 to December 1974 and I am fully convinced that he had voluntarily supported espionage activity at my military organization. 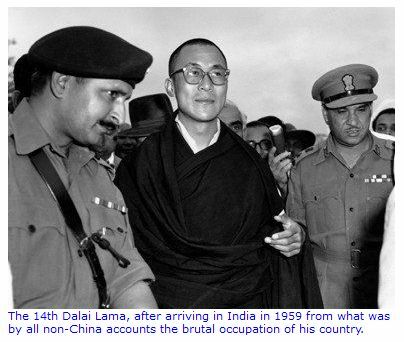 Special Frontier Force – The Problem of Espionage: Chinese Intelligence correctly guessed that the 14th Dalai Lama had escaped from Lhasa to seek asylum in India after the failed Day of National Uprising in Tibet. Peking(Beijing) had announced that the 14th Dalai Lama had arrived in India, a day before New Delhi could make a formal announcement. The Chinese intelligence always remained ahead of the United States, India, and Tibet. 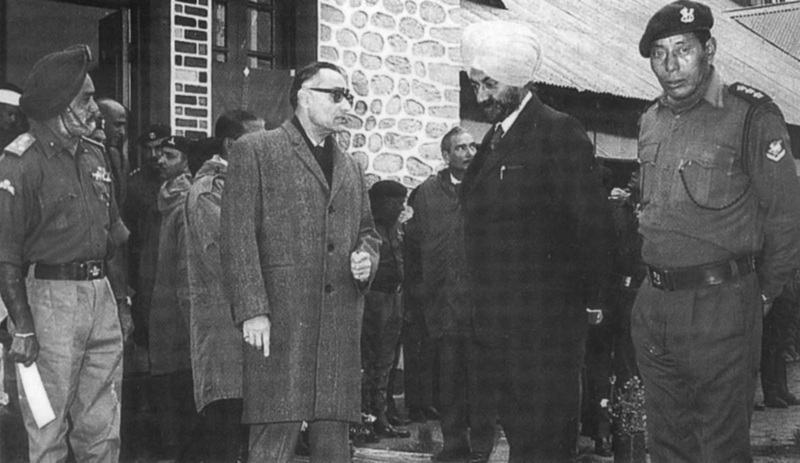 Special Frontier Force – The Problem of Espionage: 54 years ago, His Holiness the 14th Dalai Lama had arrived in India on March 31, 1959. A Guard of Honor was presented by the Assam Rifles after he crossed into India’s North East Frontier Agency(Arunachal Pradesh) at Chutangmu/Khenzimani in TAWANG sector. The Chinese intelligence pursued him constantly monitoring his movements and activities all these years. Special Frontier Force-The Problem of Espionage: Dapon/Political Leader Radug Ngawang had served at Establishment No. 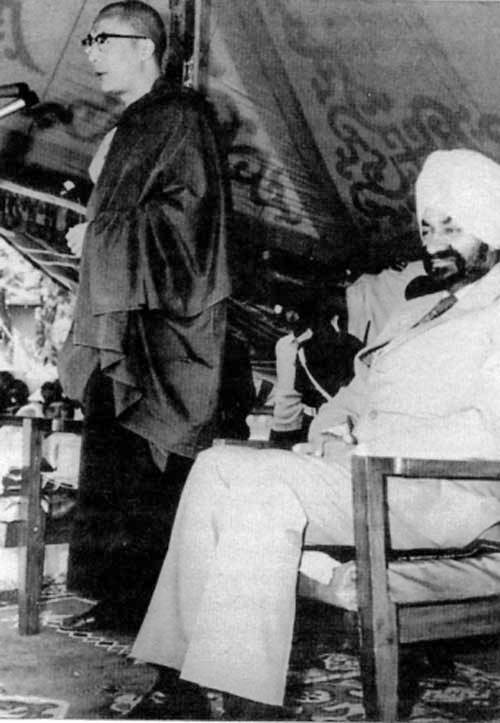 22 or Special Frontier Force after arriving in India along with His Holiness the 14th Dalai Lama. The Tibetan Government-in-Exile had simply dismissed him from Service and had spared him from punitive retaliatory action even after knowing that he had harbored Communist spy or spies. His Holiness had treated him with mercy and compassion in due recognition of his past performance before falling prey to Chinese influence. Special Frontier Force-The Problem of Espionage: This is the photo image of Ratuk or Radug Ngawang at 84-years of age. While giving interviews to Indian news media and other writers, Ngawang had shared photo images that were illegally taken at Establishment No. 22 or Special Frontier Force where such photography is strictly forbidden. I have no hesitation to identify him as a Communist Agent who had supported espionage activity. The term ‘intelligence’ is used to describe government operations that involve evaluation of information concerning the strength, activities, and probable course of action of its opponents. Espionage involves gathering of ‘intelligence’ information which is further used in evaluation to design a political, or a military course of action to deter the enemy. Radug Ngawang had exposed his participation in espionage by releasing the following photo images that were taken at Establishment No. 22/Special Frontier Force during 1971-1972 prior to his dismissal from Service in 1976. He clearly understands that the possession of these images is illegal and he is fully aware of the fact that the people shown in the images had no clue that they were being secretly photographed. Special Frontier Force-The Problem of Espionage-Photo provided by Dapon/Political Leader Ratuk Ngawang. 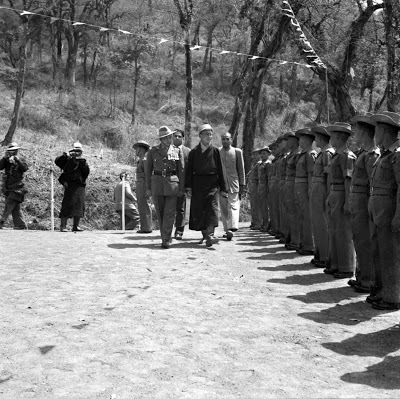 In this illegally taken photo image, Gyalo Thondup, the 14th Dalai lama’s elder brother is seen addressing the Tibetan men who serve in Establishment No. 22/Special Frontier Force and had encouraged them to join the War of Liberation of Bangladesh 1971. From right to left the persons seated are 1. Brigadier T S Oberoi, Commandant Establishment No. 22, 2. Mr. R. N. Kao, the Secretary, Directorate General of Security and RAW(Research and Analysis Wing), and 3. Major General Sujan Singh Uban, the Inspector General Special Frontier Force. None of us were aware that this photo was taken. Photography was strictly forbidden. Special Frontier Force-The Problem of Espionage: This is an illegal photo image shared by Political Leader Ratuk Ngawang who is at far left. 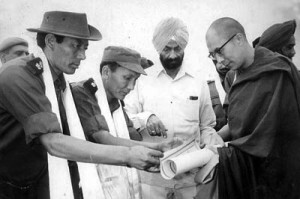 His Holiness the 14th Dalai Lama(right), Major General Sujan Singh Uban, the Inspector General Special Frontier Force (second from right), and Senior Political Leader Jamba Kalden(third from right). A Chinese spy(later discovered in the robes of a Buddhist monk) secretly took this photo on June 03, 1972 when His Holiness had visited Establishment No. 22 for the very first time after its inception in November 1962. These Political Leaders lost their jobs because of the problem of espionage. 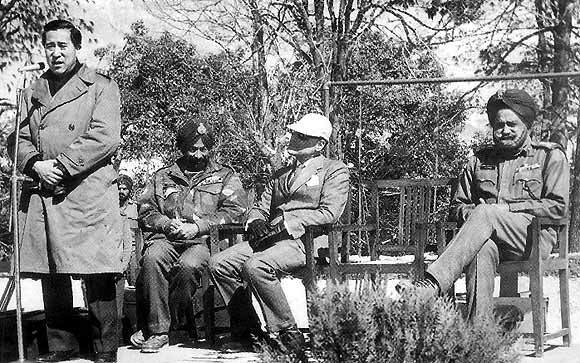 Special Frontier Force-The Problem of Espionage: Political Leader Ratuk Ngawang is seen standing at right looking towards the photographer. This illegal photo image was shared by Ratuk Ngawang and it helps me to identify him as a Communist Agent who had harbored Chinese spy/spies at Establishment No. 22. 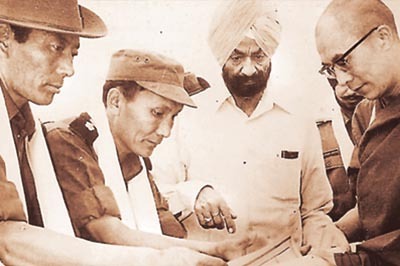 Other people, Major General Sujan Singh Uban Inspector General Special Frontier Force(second from right), Mr. R. N. Kao Secretary Directorate General of Security-Research and Analysis Wing-RAW(third from right), and Brigadier T S Oberoi Commandant Establishment No. 22(far left). I had served with these people including Ratuk Ngawang from September 1971 to December 1974 and I can very easily confirm that this photo is the evidence of the problem of espionage. Special Frontier Force-The Problem of Espionage: For the first time in the history of our military pact and alliance with Tibet, His Holiness the 14th Dalai Lama, the Head of Tibetan Government-in-exile had accepted our invitation to visit Establishment No. 22. This was entirely a private visit and it was kept as a ‘top secret’. Photography during this visit on June 03, 1972 was strictly forbidden. However, Political Leader Ratuk Ngawang had a copy of this photo and he had shared the same with a news reporter who had interviewed him at his house in New Delhi several years after his dismissal from Service during 1976. Senior Political Leader Jamba Kalden had become a victim of this espionage and had to retire from Service for he had failed to prevent this crime. Special Frontier Force-Establishment No. 22 – The Problem of Espionage – Illegal photo image taken on June 03, 1972. His Holiness the 14th Dalai Lama maintained a safe distance from the activities of Establishment No. 22/Special Frontier Force. However, during 1971-72 he had to make an exception as he had granted his permission to train his men by allowing their participation in the Liberation War of Bangladesh 1971. I had participated in this military action known as ‘Operation Eagle’. 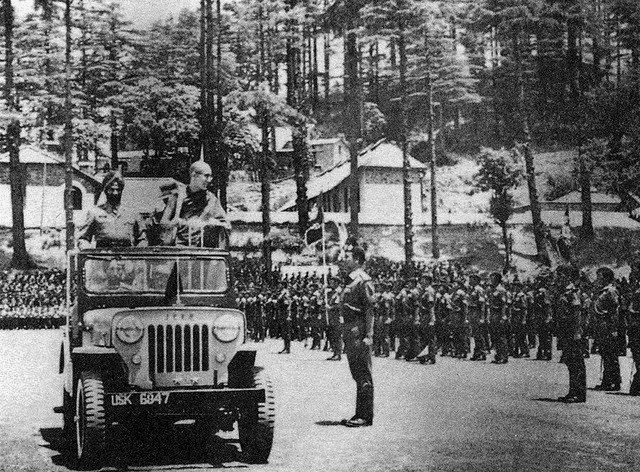 In an attempt to stall this military operation, Dr. Henry Alfred Kissinger, the US Secretary of State had personally urged China’s Prime Minister Zhou Enlai to attack India across the Himalayan frontier(North East Frontier Agency-NEFA-Arunachal Pradesh). China did not comply with that request as China gave a high priority to secure the defeat of US Army in Vietnam. Special Frontier Force – Establishment No. 22 – The Problem of Espionage – Illegal photo image taken on June 03, 1972. This was a historical moment and yet it was not expected to be captured in a photo image. A Chinese spy dressed in the robes of a Buddhist monk was later arrested at Establishment No. 22. I was informed about the death of this spy on January 10, 1973. I do not know the exact date of death. The body was cremated according to Buddhist rites and the cause of death was not confirmed by an autopsy. Indian Intelligence Bureau official had expressed his sense of indignation and was totally dismayed by the attitude of Political Leader Ratuk Ngawang who had failed to deliver the spy to Indian Intelligence Bureau for their interrogation and investigation of the problem of espionage. The fact that this photo image exists is the clearest evidence of the Chinese espionage at Establishment No. 22-Special Frontier Force. While I had served in Special Frontier Force-Establishment No. 22 from September 1971 to December 1974, I had interacted with Political leader Ratuk Ngawang on numerous occasions during our routine training activities. I never had the opportunity to medically examine him or interview him at my Medical Inspection Room/Hospital Wing of Establishment No. 22. I am not surprised to know about his dismissal from Service during 1976 after the Tibetan Government-in-Exile had decided not to frame any charges against him. I have no doubt in my mind that he is not fit to be a member of the Tibetan Resistance Movement. He lost his desire to resist the Enemy.